This conjecture is probable, given that when Francis was in Jerusalem in May 2014, he hid his pectoral Cross likewise in order not to “offend” the rabbis, who deny Our Lord and are the heirs of those who crucified Him. We see that anyone could have mentioned God in these contexts without displeasing the Freemasons. At this point, a reader could object: “You are assuming the EP indisputably represents the ideals of Freemasonry, a presupposition you did not prove. So, either prove it or be quiet.” In fact, without proof offered on my part, the objection would be valid. Then, let me pause to do so, before returning to the papal speech. The pioneer of the present day EP was Count Kalergi (Richard Nikolaus von Coundenhoven-Kalergi; 1894-1972). In 1922, he was reportedly accepted in the Masonic Lodge Humanitas in Vienna. That same year he launched the Pan European Union. Very soon after its birth the movement was financed by Louis Rothschild, Max Warburg, Paul Warburg and Bernard Baruch. 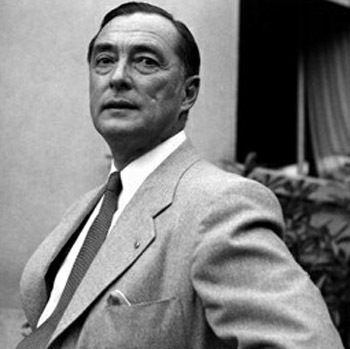 In 1923, Kalergi published the Pan-Europa manifesto; in 1924, he founded the Pan Europe journal, and from 1925 to 1928, he published his great three-volume work Fight for Paneurope. The first Congress of the Pan-European Union took place in 1926 with 2,000 delegates. At this Congress Kalergi was elected president of its Central Council, a position he held until his death in 1972. The European Freemasonry supported the movement. With the rise of Nazism – which preached the primacy of the German race and, therefore, went against the ideal of the European Union – Hitler attacked the movement as Masonic and persecuted Kalergi. He fled first to Czechoslovakia, then to France and, via Switzerland and Portugal, he ended in the United States as a professor at New York University. This part of his life inspired Hollywood to portray the hero in the movie Casablanca. After the war, Harry Truman read an article by Kalergi and adopted his ideas of a United Europe as an official policy of the United States. In November 1946, Kalergi sent an inquiry to all of the European parliaments requesting a gathering to promote the union of Europe. This inquiry gave birth to the European Parliamentary Union, which met for the first time in 1947. Besides all these initiatives that establish Kalergi as the effective founder of the EP and the European Council, in 1955 he also proposed Beethoven’s Ode to Joy as the European Anthem, which later on was also adopted by the European Union. 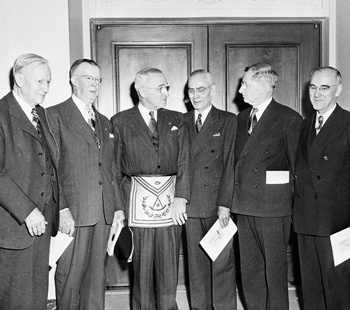 Now, the inconvenience of having Kalergi as the father of EP was that everyone knew that he was a Mason and that his successful endeavor was identified with the ideals of Freemasonry. Thus, to tidy up this ideal and distance it from its obvious source, another entity with identical goals, but composed of different men, was created and is presented today as the origin of the European Parliament and the European Council. This new look of the origins of the EP is based on an economic-political post-WWII agreement that some nations made to prevent Germany from exploiting its own coal and steel in fear of a possible rebirth of its war industry. In 1950 French minister Robert Schumann made a Declaration that is considered the founding document of the European Coal and Steel Community. On January 1, 1958, an assembly of that Community signed the Treaty of Rome, which renamed the organization the European Commission. 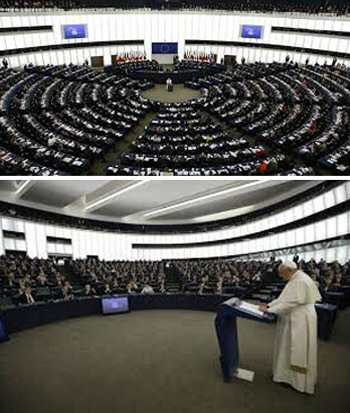 Its assembly became the European Parliament. So, when Pope Francis affirms that the EP must be faithful to the spirit of its founding fathers, he is indirectly referring to the spirit of Count Kalergi as well as the other promoters of a One World Order. 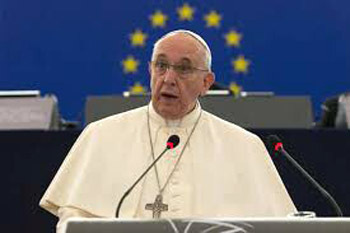 Thus, in brief, we have a Pope who goes to an organ of the Universal Republic, conceals his mission as Vicar of Christ, but uses the prestige of his position to encourage the members of the European Parliament to be more ardent in accomplishing the ideals of Freemasonry to which they are committed. Not a word about Our Lord, not a word about the Catholic Church, not one single attempt to convert those members. How can we be surprised that Freemasonry and its lackeys don’t miss one opportunity to praise Pope Bergoglio? On the old Masonic plan to establish a Universal Republic, read The Universal Republic Blessed by the Conciliar Popes by the author of this article.